Sequim home sales over the past year tells a story, but it’s a story that needs to be put in context, or it won’t have much meaning to most people. I’ve tracked sales for each year going back to 2012. The resulting bar chart below is fascinating. 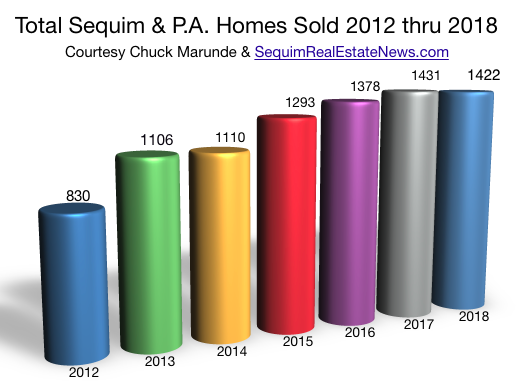 In 2012 Sequim home sales were at 123 for the whole year. This data focuses on one niche, which is Sequim home sales between $300,000 and $600,000. This is the niche most retired professionals are in when they buy a home in the Sequim area, at least most of my buyer clients. I’m also including all of Clallam County, which is primarily Sequim and Port Angeles, but includes the rural countryside, too. 567 homes sold in 2018, which is surprisingly higher than 2017, even though we had so many buyers who had trouble even finding a home because of the low inventory. Sequim Home Sales Increasing or Decreasing? In this chart below, I show all Sequim homes sold in all price ranges, and you get a picture of the market as a whole from the lowest prices to the multi-million dollar homes. There are some apparent contradictions in the sales data when you consider what has been happening at the street level between buyers and sellers. Many buyers have had trouble finding their ideal home because the inventory of those homes has been so low and almost non-existent, at least for some buyers. Many buyers have told me they have not bought because they can’t find a home they like. And yet we have had increasing sales through 2018. How do we account for that? I think we can say that some retirees are willing to compromise and buy a home that falls short of their ideal. Some have decided to remodel an older home, and some have bought a home they plan to replace in a few years. That would capture some of the buyers, but what about the rest who have apparently bought homes even in a low inventory market? We do have buyers in the wings waiting for their ideal home to show up in the Sequim MLS. The winter months always slow down slightly, and there have been a lot of things going on around the country that have caused many retirees to pause on their decision to buy a home in Sequim, but as we move into the spring and summer I think sales will begin to pick up again. My primary niche is as a buyer’s agent helping retirees buy homes above $300,000. You can use my online Sequim MLS site, and you can email [ChuckMarunde@gmail.com] or text or call [360-775-5424] anytime for help finding your home or getting your questions answered. Sequim home sales have been improving, but I thought it might be helpful to see a visual aide on Sequim home sales that compares sales in 2014 and 2015. Enlarge the image below by clicking on it with your mouse. Below the bars you’ll see the price range. 100-200 means $100,000 to $200,000. The blue bars represent Sequim home sales in 2014 (light bar) and 2015 (dark bar). The green bars represent Port Angeles home sales in 2014 (light bar) and 2015 (dark bar). The chart is easier to see if you enlarge it. This is interesting data, because it tells us a story. Once again the majority of homes sold were under $400,000. As you can see, the number of homes sold in the higher price ranges are small (shown above each bar). We can also see that in 2015 as in 2014, more homes sold in every price range in Sequim than in Port Angeles, except below $200,000. Above $200,000, there were more Sequim home sales in all but one price range ($700,000 to $800,000), but that was only a difference of two homes. Overall, there were many more Sequim home sales in 2015 than in 2014, and this is good news. That’s especially visible from $200,000 to $300,000 on the chart. Sequim home sales are especially strong from $200,000 to $500,000. We’re coming up on a presidential election, and there are patterns for the economy and the real estate market in election years. After an election like this one, the economy is likely to show signs of strength throughout 2016. It is my opinion that 2016 will show us strong Sequim home sales. The Sequim real estate market report for June of 2015 confirms the trend of an improving market, but alone this report doesn’t tell us anything startling. Probably the most interesting data is the increase in the number of homes sold in June. It’s been a very interesting real estate market this year. Sales have picked up and the inventory is way down. In June home sales were 26% higher than in May and 35% higher over June of last year. That’s a big increase, and it indicates buyers are more aggressive this year than in past years. Many listings are selling at full price, and there’s now some competition among buyers on many properties. The data doesn’t tell the whole story about buyers and their motivations. Many buyers are not finding their ideal home. I believe if the inventory wasn’t so limited right now, we would see even higher sales numbers. That would place us at about the same total sales numbers as we had in our peak year, 2005. I believe we have some pent-up demand that will mean continuing and maybe increased sales in the months ahead. I created showing sales from 2005 to 2015, which you can view at Sequim Real Estate Market Trends. 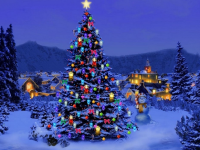 Who is looking at Sequim homes in the winter? Many buyers are. I’ve been out showing Sequim homes to two different buyers this week with temperatures dipping to freezing and below. As always, I had a great time taking my clients around and showing them homes. We looked at several gorgeous homes, and three had very impressive water views. Every showing is an adventure and each home has a story. Last month from November 1st to November 30th, buyers closed on 91 properties in Clallam County. There are 20 week days in November, so this means that 4 or 5 homes closed every day in November. And this is November in the middle of a cold winter. In this small market, those are big numbers. In November of 2012 only 55 properties were sold. This November’s sales are a massive 60% increase over last year. Let no one say homes don’t sell in the winter in Sequim and Port Angeles. This is proof beyond a reasonable doubt that homes are selling all year long here. The homes that sold last month are in all price ranges all the way up to almost one million dollars. The homes I showed yesterday are gorgeous homes ranging in price from $498,000 to $1.1 million. Two of the homes that I sold in November included a $500,000 home in Port Townsend and a $225,000 home in Brinnon, which is 25 minutes down Highway 101 from Sequim. I helped my buyers on that sale to purchase the home from a Bankruptcy Trustee. The home will require perhaps $200,000 to finish it, but then it will be worth roughly $800,000. It was a very complex buying process, because a Trustee has a different set of legal requirements when it comes to selling an asset like a home. It took about a year to get that transaction closed. Serious qualified buyers do not stop planning their retirement move just because the temperature doesn’t cooperate with their travel plans. Actually, coming to Sequim may be a reprieve, especially if your coming from Colorado or New York or Texas where all the bad weather is creating problems. Sequim homes are selling even in these winter months. Which online MLS website is the best? I recommend Sequim4Sale.com. Come to Sequim and let me show you some Sequim homes. Sequim homes are selling at a substantially increased pace. I’ve compiled data for the first quarter of every year since 2003 to get an accurate picture of how Sequim homes sold so far in 2013 compares with past years. Here’s a nice visual aide that makes the point better than words. The peak of the real estate market in Sequim was 2005, and for Port Angeles it was 2007. Sequim homes sold started a steady decline from 2005 to 2009 with a burst of activity in 2010, and then 2011 and 2012 maintained lower but level sales numbers. 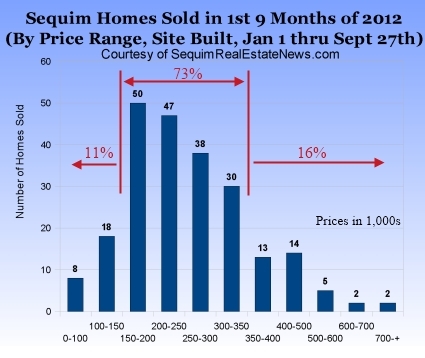 As the tall blue bar shows so clearly, in the first quarter of 2013, Sequim homes sold took a huge leap to 96. That is a 100% increase over last year at this time. While this is generally good news for sellers, it may not be for buyers. Some buyers are having some difficulty finding their ideal retirement home, and that is precisely because the best homes in the best areas are selling. That segment of the inventory is shrinking. Will this momentum in home sales continue throughout 2013? That remains to be seen, but we certainly are off to a good start for 2013. Sequim homes are selling in a surprisingly strong market right now. 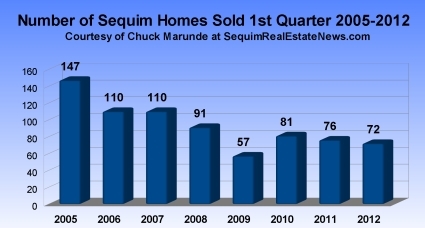 Sequim home sales have seen a substantial increase so far in 2013. In this graph you can see that in the first three months of 2013 compared with the first three months of 2012, sales have increased by large margins. This is good news for home sellers, but for buyers it means market prices are stabilizing and inventory is shrinking. January sales have increased by 33%, February sales increased by almost 300%, and March Sequim home sales have increased by 33%. These are extraordinary increases in sales during the slow winter months of January through March. 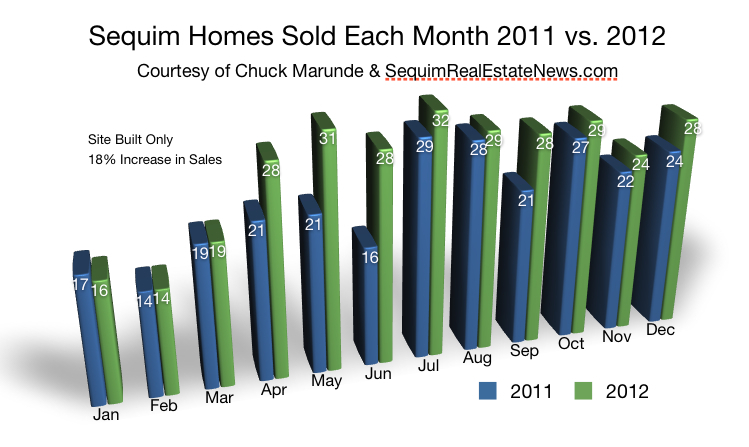 More evidence can be seen in this article about Sequim Home Sales comparing each month’s sales in 2011 and 2012. 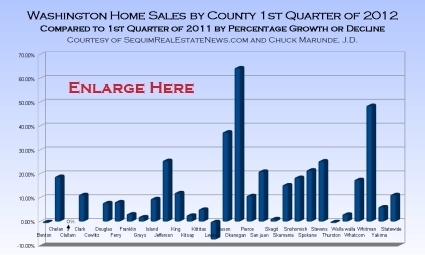 And in this article about Sequim Homes Sales prices bottoming out. And in this third article entitled Sequim Real Estate Selling and Inventory Shrinking. All of this means that buyers are now having to make timely decisions once they find their ideal home. Procrastination can mean someone else made that offer and bought the home you wanted. This is no sales pitch. The market data and the pace of selling has increased so much, some buyers are having difficulty finding their ideal retirement home. Sequim homes sales are on the increase and that is good news if the real estate market continues to recover. Sequim home prices are not easy to understand for buyers from out of state. When you come to look at homes in Sequim, how can you know if Sequim home prices are reasonable. The last thing a retiree wants to do is overpay for their retirement home. With almost 1,400 articles on this Sequim real estate blog, you’ll find dozens of articles specifically addressing prices, how buyers can determine fair market value, how buyers can be sure they’re not overpaying, and how to negotiate the best possible price. In addition, I give buyers books written about Sequim real estate, which include chapters on Sequim home prices and fair market value. Did I mention that all of this is absolutely free? Here’s another valuable piece of information for buyers about Sequim home prices. I love cracking open the hidden door of truth for buyers, and I’m doing again here. You’ll see public data on the selling prices of homes as a percentage of their listing price, and that percentage is often quoted in the mid-90s. For example, the first three months of this year the MLS (multiple listing service) shows real estate selling at about 94% of it’s “original listing price.” Oh my. Wait until I show you how flawed that statistic is. Here is a chart showing Sequim home prices for the first three months of 2013, comparing the MLS data representing the percentage that the selling price is of the “original listing price” and the real original listing price as a percentage of the selling price. I’ll explain the difference. Have Sequim home prices bottomed out? There’s good news from around the country. One of the most widely followed measures of home price changes is the S&P/Case-Shiller home price index. It tracks price changes monthly in 20 major U.S. cities. In December, the value of homes in the 20 cities Case-Shiller measures rose by 6.8% year-over-year. In Lost Angeles, there was a 10.2% rise in home prices last year. In 2012 housing prices rose 10.6% in Miami, 12.2% in Minneapolis, 12.9% in Las Vegas, 13.6% in Detroit, 14.4% in San Francisco, and 23% in Phoenix. But what about Sequim home prices? What about the Sequim and Port Angeles area? I compiled the sales records going back to 2006, and this graph shows the average sales price of all Sequim homes sold from $150,000 to $500,000. Actually, I included all Clallam County, which of course is primarily Sequim and Port Angeles. 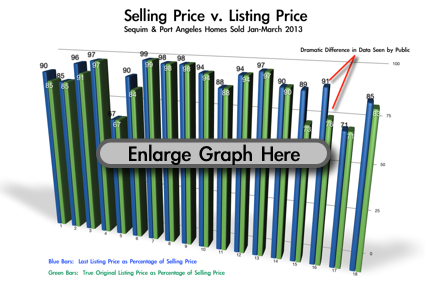 Clearly the data shows us that the average price of Sequim home prices bottomed out in 2011. The trend is unmistakable. From 2006 prices decline every year through 2011, and then there is a leap from $236,000 to $248,000 in 2012, and again another increase in 2013 thus far. I’m cautious about proclaiming a market recovery, and I’m not doing that here. What I would suggest is that the sales data indicate we are in the second year of increasing prices. 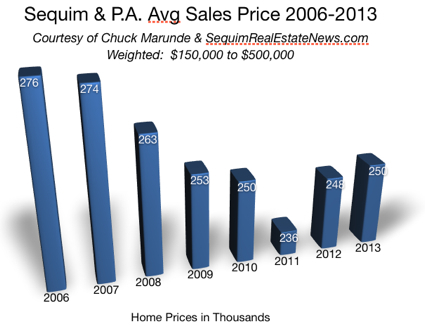 That’s pretty solid data demonstrating that Sequim home prices are on the increase. 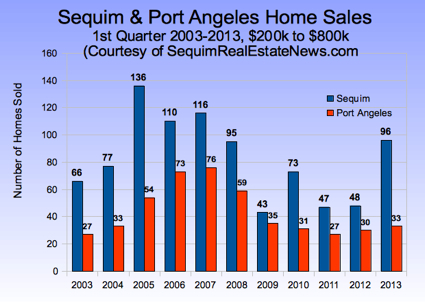 How do Sequim homes sold compare to Port Angeles homes sold during the calendar year 2012? I’ve organized the data by price ranges to make more sense out of the data. As a buyer, you may want to compare Sequim homes and Port Angeles homes, and this chart is one way to see what has been happening. 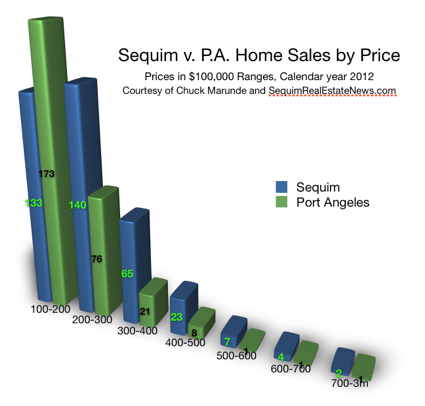 Here’s what this information reveals on the supply and demand of Sequim homes and P.A. Homes in 2012. 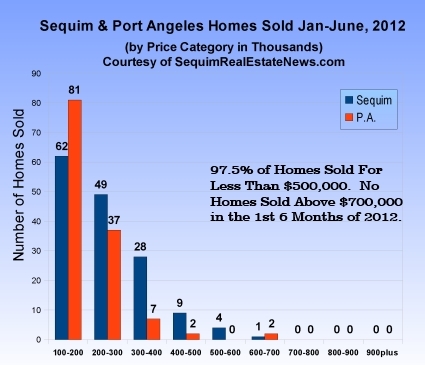 Port Angeles sold 57% of the homes under $200,000 compared to Sequim’s 43%. But apparently, Sequim wins in all higher price ranges. Port Angeles sold 35% of homes from $200,000 to $300,000, while Sequim homes sold accounted for 65%. From $300,000 to $400,000 Sequim won 76% to 24%, and from $500,000 to $600,000 it was Sequim 88% and Port Angeles 12%, and finally at $600,000 and above Sequim homes sold represented 75% of sales and Port Angeles homes sold represented only 25%. I think it is fair to draw two conclusions from this data. [Source of data: Olympic Listing Service]. First, for all homes sold below $200,000, Port Angeles sells slightly more homes than Sequim, but in all higher price ranges, Sequim homes sold are accounting for about 75% of sales and Port Angeles only 25%. Clearly, retirees are drilling down on Sequim homes much more than Port Angeles homes. 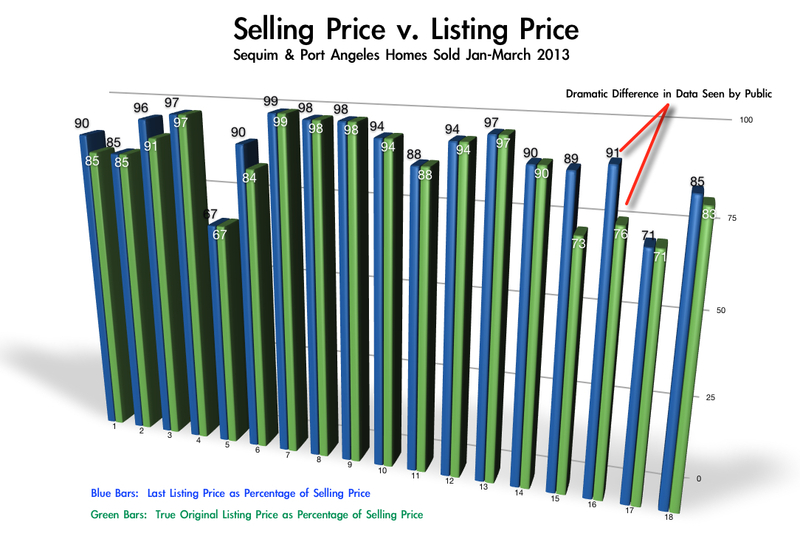 Sequim homes sold have increased in 2012 compared to 2011. 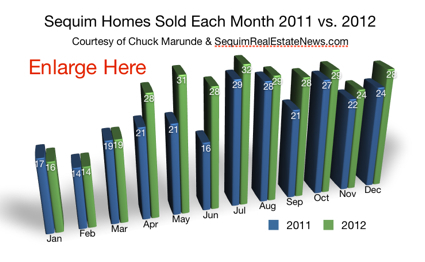 I’ve compiled data showing Sequim homes sold in each month of both years. 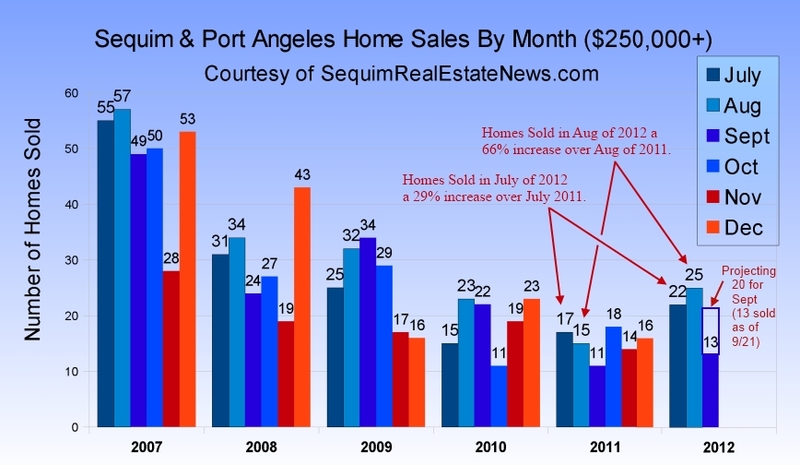 Total Sequim homes sold in 2012 have increased by 18% over 2011. That’s good news. That’s a big jump in sales. I don’t think we can jump to conclusions, in other words, I don’t think we should conclude that the real estate market is in recovery now. But it still is a good sign, and should be an encouragement to homeowners wishing to sell their homes in Sequim and Port Angeles. You can see on this chart that sales in April, May, and June were substantially up in 2012 compared to 2011, but the last quarter of the year had improvements in each month, too. I’m also pleased to report that this brokerage is selling more than our share of homes each month, even during the winter months. That has a lot to do with our massive Internet marketing approach that reaches out to buyers all over the country. If you are a homeowner planning to sell your home, email us your questions (or call anytime), and we will be glad to help in any way we can with no obligation. Hopefully, this report on Sequim homes sold has been encouraging to you. Sequim home sales picked up in the last quarter of the year by a significant margin over the same time last year. This was good news for many home sellers, but not for all. Many still are impatiently waiting for their homes to sell. But I have a prediction for 2013 that should encourage sellers. This doesn’t mean sales will pick up so much that anyone who wants to sell their home will. That would nearly describe Sequim home sales in the early 2000’s up through 2005. We are a long way from a strong real estate recovery. I’ve been writing for two years about how the inventory of the best homes in Sequim and Port Angeles are selling and not being replaced. Our inventory is shrinking too. At the same time we have an increasing number of retirees who are making their move. With a shrinking inventory we still have increased Sequim home sales. I believe that this trend will continue, so that sales throughout 2013 will far outpace 2012. This certainly doesn’t mean sellers can simply do what they did in 2005 to sell their homes. The world has changed dramatically since 2005, and old ways of marketing no longer work. In addition, buyers’ behavior is different, not to mention that they search for their homes with completely new tools. Newspapers are dead when it comes to selling real estate, and the Internet reigns supreme, and buyers know how to use it. It’s a different world, and sellers need to adjust their marketing plans accordingly. Sequim home sales are picking up but sellers will have to adapt to the changing times. 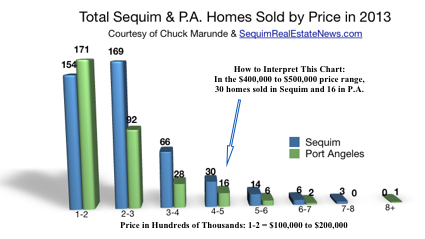 Tell Me About Sequim Home Sales: A Market Bottom? Sequim home prices may be on a slow path to normal, but dramatically increased Sequim home sales are a pretty good indication that this local real estate market may have bottomed out. Having said that, no one can say for sure that we won’t have another dip in the market, but take a look at this chart showing Sequim home sales in various price ranges and take a look again at how sales have increased over last year my earlier article Sequim Real Estate Market Report. By the way, I write very conservatively, and this is the first time in over 1,000 articles that I have suggested the Sequim real estate market may have bottomed out. Sequim Home Sales Increase: A Market Bottom? Seventy three percent of Sequim home sales in the first nine months of 2012 were from $150,000 to $350,000. Sequim homes sold above $350,000 only account for 16% of the market. Homes sold above $500,000 make up less than 4% of all homes sold. If you’re interested in exactly what kinds of homes retirees are buying, you might enjoy The Sequim Bell Curve in Real Estate. First time home buyers, working couples, and investors are buying mostly in one price category, $150,000 to $200,000. From $200,000 to $350,000 the vast majority of buyers are retirees. I like the way a graph can display complex data and make sense. “A graph is worth a thousand words,” as Arthur Brisbane wrote in 1911, or words to that effect. (Actually the newspaper editor was the first to come up with the phrase, “Use a picture. It’s worth a thousand words.”). Sequim home sales by price sold when analyzed with the other two graphs in the above articles is revealing information and may be the best evidence we may be at a market bottom. This Sequim Real Estate Market Report reveals a very interesting view of home sales in Clallam County in the fall season. I was motivated to look at these stats, because I learned today about a couple who had their home on the market for a year and didn’t sell it, and they just decided to pull it off the market for the winter months starting in September. I thought about that and asked, “Who is telling these good folks that homes don’t sell in the winter months?” I periodically hear sellers say that homes don’t sell in the winter months. That simply is not true. Homes are selling every week during every winter month. I’ve been very busy showing homes in July, August, and September, more than during the same period in the past several years. Home sales are up substantially from the past two years, and here is the proof. I will demonstrate that with this graph and an explanation. Click on this graphic to enlarge it. The data shows in this Sequim real estate market report that sales in July of 2012 have increased by a huge 29% over July of last year, and sales in August of 2012 have increased a gigantic 66% over last August. In September of 2011, 11 homes sold, and already through September 21st of 2012 we have 13 homes sold. I’m projecting that another 7 homes will close before the end of September, which will mean almost a 100% increase in sales this September over September of last year. I think it is fair to project November and December will have substantially more sales than the same months last year. For an analysis of your home and where it stands in this market, call Chuck Marunde at 360-775-5424. If you would like to know more about this Sequim real estate market report, email or call Chuck. Sequim home sales in the first half of 2012 reveal a lot about the Sequim real estate market. I’ve compiled data from the Olympic Listing Service for the first six months of 2012 showing Sequim home sales and Port Angeles, too. It’s no surprise that the majority of Sequim home sales are from $100,000 to $400,000, but what may be surprising is that so few homes are selling above $400,000. 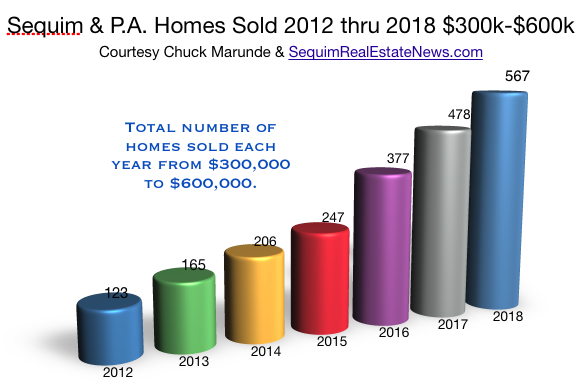 As I’ve shown on the graphic above, 97.5% of all Sequim home sales are under the price of $500,000, and in the first six months of 2012 not one home has sold above $700,000. That’s disconcerting for homeowners trying to sell in that price range. I will add that I recently sold a home for $725,000 in June but it is not represented on this chart because it actually closes in the first week of August. It’s clear from this data that Sequim home sales of luxury homes or homes in the higher price ranges are very slow this calendar year. There are many factors that contribute to slow sales of higher priced homes. Buyers from California, Colorado, and other states are up against tough markets, and selling their homes first has been exceedingly difficult, although sales have picked up in selected areas of the country. In the San Francisco Bay area buyers are competing against each other for some homes and forcing prices upward, even above the listing prices. Even in Sequim I’ve written about how competition has heated up for the ideal retiree home, a three bedroom, two bath home in a nice area and priced from $250,000 to $350,000. Still this leaves the upper priced homes sitting on the market without qualified buyers who are ready, willing, and able to close. As I explain to clients, one of the most important things they can do right now in this real estate market is make sure their home is effectively marketed by a professional who has experience to do the job. No professional can guarantee a buyer will come along in any time period, but the first task is to get your home marketed to as many qualified buyers as possible. I don’t believe in luck, but I do believe in preparation, hard work, and perseverance in marketing. Of course, one needs creativity in this technology age, and one needs to tap into a powerful Internet system. But having done all that, I am reminded of a title to a book I read many years ago. The book title is All You Can Do Is All You Can Do, and the subtitle is And That’s Enough. If you’ve hired a great Realtor and your home is getting great exposure, leave the rest to destiny, at least as far as Sequim home sales are concerned. What have Sequim home values done before and during this recession? What is the trend for home prices in Sequim and where do we stand today? I had a client call from California to ask me my opinion of the value of her home. She paid $300,000 for it in 2007, and yet today it is worth much less, almost precisely the tax value that the Clallam County Tax Assessor gave it this year, which is $186,000. [Read the full story at Did I Pay Too Much For My Home?] The County assessed values are not always right on. Sometimes they are high, and sometimes they are low. In this case I think they got it right. And I’ve been surprised at how many times the County Assessor has got it right. I sold a home recently in the Sunland Golf Course area. 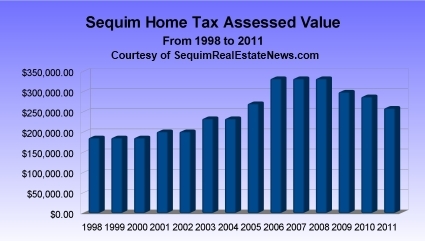 Charting the Tax Assessor’s values from 1998 through 2011 creates a chart that shows the pattern of Sequim home values over these years. I charted many homes in the same way, and I was fascinated to see precisely the same pattern each time. While the prices are different from home to home, the Sequim home values tend to show the same percentage increases and decreases in value in the same years. If you look at the value the Assessor’s software assigns to your home, you might be surprised at how accurate it is in light of the true fair market value of your home in this market. As I said earlier, sometimes the Assessor’s values are off, and sometimes way off, but more often than not, they are turning out to be fairly accurate lately. Fortunately, Sequim home values appear to be leveling off for now. Are homes sales increasing around the state of Washington and in the Sequim area? The questions have come up periodically. Is the real estate recession over? Has the recovery started? The news has taken us on a roller coaster of bad news and then good news and then bad news again. It seems reports come out one week with the talking heads proclaiming we are in recovery, only to have a new report out the following week with another expert telling us that we won’t see a recovery for a long time. Enlarge this graphic by clicking on it, and you’ll get a clearer picture of how homes sales this first quarter of 2012 compare with the first quarter of 2011 on a percentage basis. Clallam County has zero growth, but at least no decline. Other counties around the state vary dramatically. For example, Okanogan County homes sales increased by 64%, Whitman County by 48%, Mason County by 37%, and Jefferson County by 25%. Lewis County homes sales decreased by over 7%. On the other hand, most other counties saw modest gains, and as you look at this chart, the pattern clearly shows home sales increasing. Will that pattern be sustained? That remains to be seen. Sequim real estate sales in the first quarter of 2012 are an indication of whether the Sequim real estate market is recovering or still on hold. The national real estate market is showing some signs of recovery according to the National Association or Realtors Chief Economist, Lawrence Yun. Since many of our buyers are retirees who must sell their homes in other states, this is relevant. Here is a chart showing Sequim real estate sales in the first three months of the year from 2005 (our peak year) to 2012. As shown in this graph, the last three years have been pretty even, 81 homes sold in Sequim in 2010, 76 homes in 2011, and this year 72 homes. Here is the positive news from the NAR Economist. Existing-home sales were down in March but continue to outpace year-ago levels, while inventory tightened and home prices are showing further signs of stabilizing, according to the National Association of Realtors. Total existing-home sales, which are completed transactions that include single-family homes, townhomes, condominiums and co-ops, declined 2.6 percent to a seasonally adjusted annual rate of 4.48 million in March from an upwardly revised 4.60 million in February, but are 5.2 percent above the 4.26 million-unit pace in March 2011. Also on a national level, total housing inventory at the end of March declined 1.3 percent to 2.37 million existing homes available for sale, which represents a 6.3-month supply2 at the current sales pace, the same as in February. Listed inventory is 21.8 percent below a year ago and well below the record of 4.04 million in July 2007. Foreclosures typically sold for an average 19 percent below market price in March across the U.S., while short sales were discounted 16 percent. Sequim real estate sales do not track national sales precisely, and I’ve written that the Sequim real estate market is shielded to some extent from the national market, but we’re clearly still impacted.